Strong men and women work for years just to be able to hold a human flag for a few seconds. But if you think that's where the story has to end, you don't know Danny Kavadlo! Most of us have seen it by now. That perfect press flag: A human being suspended on a vertical pole, elbows locked, with no point of contact other than their own two hands. It&apos;s mind-blowing. Riveting. Spellbinding. Whether it was at the playground or on YouTube, few can forget the first time they witnessed this feat of super-human strength. The combination of power, precision and balance never fails to leave an indelible impression. 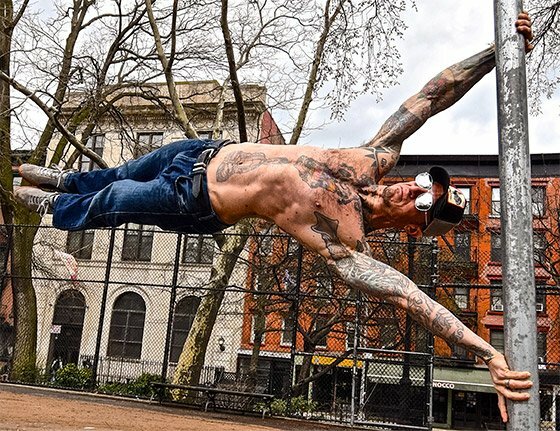 Sure, detractors are quick to claim that the human flag doesn&apos;t represent functional strength or absolute power, but is rather just a way to show off. I vehemently disagree. What&apos;s more absolute than this maneuver, which is only learned—or rather, earned—through countless hours of technical and muscular training? As for function, riddle me this: Have you ever seen a weak individual pull it off? I thought not. 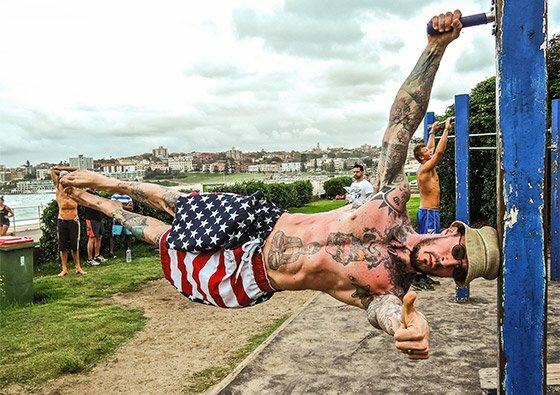 Look around online, and you&apos;ll find many tutorials, articles, and blog posts which discuss how to train toward performing a full human flag. They&apos;re everywhere, and some are better than others. But what I&apos;ve never seen is an article that speaks about where to go beyond the human flag. First things first: Anyone who can perform the classic flag for even a few seconds is a serious force to be reckoned with, so give yourself the credit you deserve if you&apos;ve ever pulled it off. But now it&apos;s time to raise the stakes. I recently wrote a piece for this website about grip power. One of the proven methods I discussed was to substitute a fat bar for a standard one. At the time, I was talking about weight training and pull-ups, but the same methodology works for advanced human flag training. "A proven method to build grip strength is to swap a fat bar for a standard one." Most human flags are performed on a bar no more than about 2 inches in diameter. A simple way to progress this beastly move is to try it on a pole that is 3, 4, or even 6 inches thick. Since you won&apos;t be able to wrap your fingers as far around the pole as you normally would, you will need to compensate. This will require extra pulling power from the top arm, lat, and shoulder. Further, there will have to be some "palming" from the lower arm; you&apos;ll barely be able to grip it at all from this angle. I find it helpful to point the index finger of my bottom hand directly to the ground. This can help to establish proper positioning. Like everything human flag-related, this takes some getting used to. The Human Flag can be progressed in ways that move past the pole itself. Incorporating odd surfaces, uneven grips, or staggered hand patterns can take your training over the edge. Whether you&apos;re flagging on a rock formation or subway station, odd surfaces generally lack something to grab onto in the first place. In these situations, creativity is the key. "Incorporating odd surfaces, uneven grips, or staggered hand patterns can take your training over the edge." One of my core philosophies in training—and life—is not only to accept, but also embrace, the fact that we must improvise. Advanced practitioners of the human flag know what I&apos;m talking about. Sometimes the rulebook has to go out the window. There may be times when you&apos;ll have to keep your palms parallel, your bottom hand open, or even use a "hook grip" from the top arm. Experiment. Push your limits. This is where things get fun! 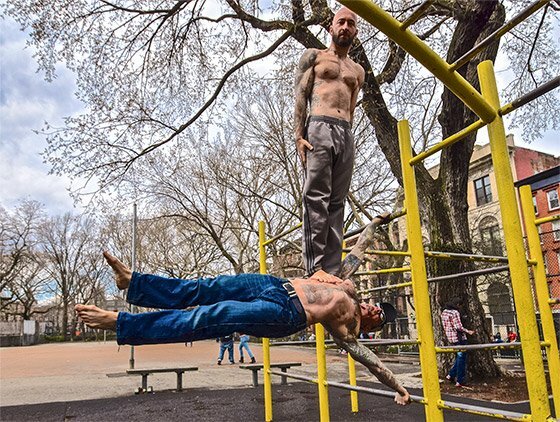 It&apos;s often been said that the ultimate progression, or "master step" if you will, is the one-arm human flag. Most folks have never seen it. In fact, it may be hard to even picture for the uninitiated. You see, when we eliminate a whole arm from the equation, we have to pick up the slack somehow. This is one exercise where it is essential to use your head—literally! "This is one exercise where it is essential to use your head—literally!" This is harder than it looks. It&apos;s not enough for the head simply to support the body; you must actively press it into the surface from which you are flagging. I recommend wearing a hat. It is also worth mentioning that this progression cannot be preformed on a pole, since a flat area for your head is required. 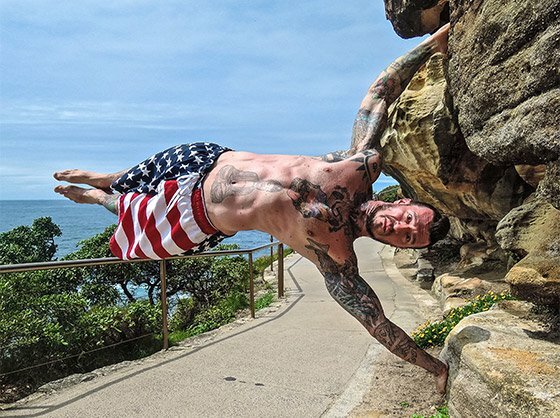 The one-arm flag takes tremendous neck strength and full body power to execute. But can we take it even further? If you&apos;ve ever done a squat, a press, or curl, then you know that adding external resistance to any exercise increases muscular demand. The human flag is no exception. Since it&apos;s already so challenging to the arms, lats, and shoulders—not to mention the entire lateral chain—adding any weight at all is serious business! You will probably feel like you&apos;re lifting your body higher than usual; you&apos;ll be fighting additional gravity. In fact, it may feel like your feet are pointing at the clouds, when in reality, they&apos;re barely parallel to the ground. This can prove to be an unexpected proprioceptive challenge, aside from the obvious strength hurdle. "This can prove to be an unexpected proprioceptive challenge, aside from the obvious strength hurdle." Further, it is important to consider the mechanics of a weighted human flag. The closer the resistance is placed to your lower body, the harder it will be. This is basic physics. Therefore, particularly when attempting this for the first time, make sure you keep the weight closer toward your shoulders, not toward your feet. I&apos;ve done this version of the human flag using weight vests, a cinderblock chained to my body, and even other humans! The gains are incredible, not to mention the wow-factor. At the end of the day, imagination is our biggest strength and our minds are our strongest muscle. Never be afraid to be creative or challenge the mainstream. This is just the beginning. Let me know your thoughts and keep aiming big and training hard! Who cares how big your forearms are if they can&apos;t get the job done? Build strength you can use with these five grip-building techniques! All too often, life won&apos;t wait for you to finish your 12-week program. Keep strong wherever you go with these resourceful full-body lifts! A stacked gym with every fitness tool known to man looks cool, but how much of it are you really going to use? Keep these three fundamentals at home, and rest easy knowing you can get strong no matter what!